The D-120 AC Slave is suitable for shooting small objects advertising and portrait art photos, children's photography, fashion photography, identification photo,etc. It expands your capabilities without sync cables. It is an excellent complement to the Master AC Slave. The AC Slave is triggered by a reliable built-in slave. Flash duration time can reach to 1/8000s and recharge time to 1-3s. They are also featured in ideal color temperature 5500K±200K and wide illumination angle, and work well if it is used together with umbrellas and umbrella reflectors. 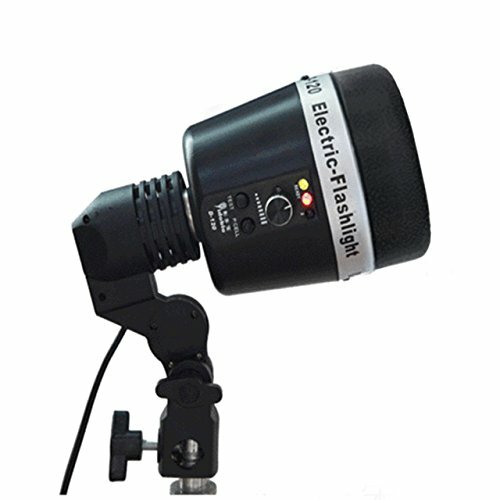 I can work with all E27 screw light, accommodate light bulbs or slave flash, built in umbrella holder and light stand mount,easy mount to light stand and easily adjustable for different shooting angles. Perfect for holder your photo umbrellas, slave flash or light bulbs. It mounts on any standard light stand. The extra long cords help you move them freely to position it for best lighting effects. Easy to use screw in head will fit standard photo bulbs. This adapter light holder will fit all your lighting needs from photo flood to strobe lights. The extra long cords help you move them freely to position it for best lighting effects. If you have any questions about this product by dison, contact us by completing and submitting the form below. If you are looking for a specif part number, please include it with your message.